for the yard sale and this new gem moved in to place. I love September. Gone are the air conditioners and fans in the windows. open the windows to get a little wind in our sails. around the house before we're stuck inside for a long, cold winter. each night since I started work on the master bedroom. which makes the room feel much larger. so you can copy them. Should we have a contest? 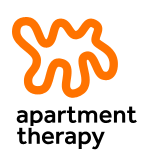 The design uses three shades of gray and black. Painting the straight lines would be a biggest challenge. I've chosen a few sea-inspired items to go on the chest. over the edge in the middle of the night. is "polished" by years of use almost making them look porcelain. Detail of the ogee edge and the simple gray line on the side. Let me know if you undertake this faux bamboo technique. I love to see and share it. The chest is lovely. Did you do the faux painting? It looks simple, but I suspect it is not. I am afraid my bamboo might have more flaws than faux.... I hope you had a wonderful weekend. I don't want to have a contest...I just want you to ship me yours! :) This was an awesome find. Again I'm convinced the east has it all. Enjoy fall! It's actually cool here....too cool. No, Bonnie. The chest was painted long ago. It just seems like a design that would be fairly easy to recreate. Maybe even on a small wood box. What a lovely piece of furniture this is Steve. I would love to try this on something smaller first. The straight lines would easily be done with two strips of tape each side. The limewash is a subtle one too so it would have to be just right before starting the 'bamboo'. Any ideas for that? 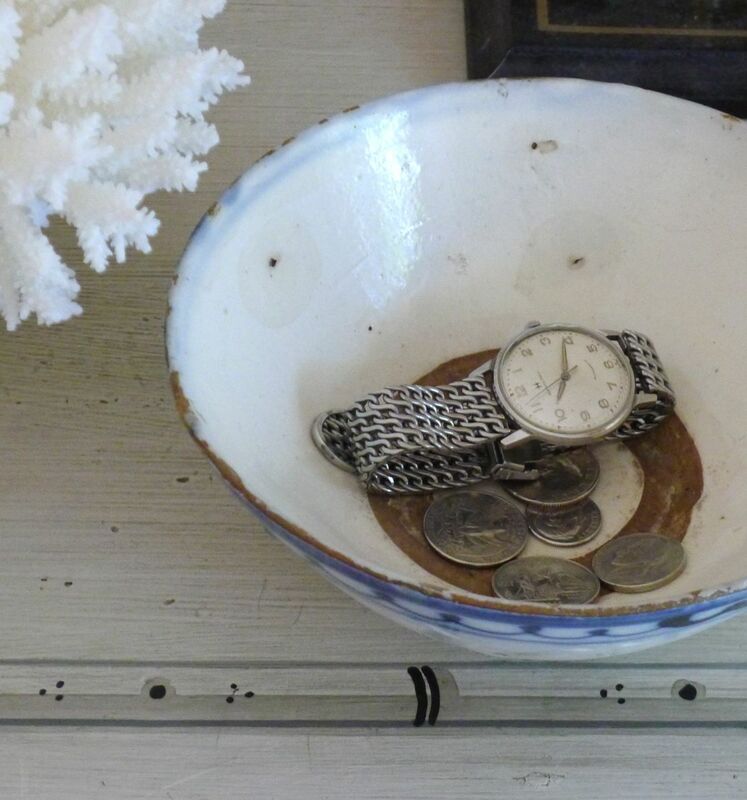 We are lucky to have a lot of good antique pieces here. A lime wash base would be a nice effect but this has quite a heavy coat of paint as the light gray base. I compared it to me Annie Sloan sample card and none of those colors are even close. I'll try to pick some close Benjamin Moore colors when I have better daylight. 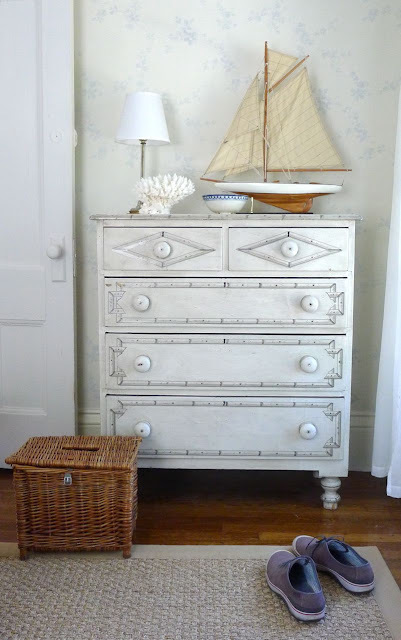 This chest is lovely- what a great find! I would love to try replicating it but am afraid I would not not do. A very good paint job. The bamboo technique is done so well though and I love how light and airy it looks! Such a great find! At first I did not realize is was faux painted. Looks like a perfect fit in its new home. The details are marvelous! I have a DIY idea. I'll give you a heads up if it turns out and I post about it. This looks great the way you've styled it. Having seen this chest in person, I don't think your excellent images can even do it justice. It is so gorgeous. It's amazing that it's a paint job from the 1880's. I know it was an art then, but isn't it funny to think about DIY'ers and artists of the past? I would love to see what people could come up with if anyone tries a copy. And didn't I see those fabulous bowls in your yard sale pictures? I'm glad you kept at least one. Have a great week. Ooooh. She is purdy, indeed! So...Is the sale all over? Really really over? I really like it! Looks great in the room. That second photo is just the perfect depiction of your description of autumn. Really beautiful. I agree, these last days have been heavenly. I concur that the photo with the breeze blowing in the curtain made me want to step into the photo. And I love how the little ship looks on the chest as well. I have a little Hitchcock rocker that I marvel about how someone painted all those straight lines. My uncle Ben threatened to haunt me if I ever re-painted it! I am with you on the window-opening/cleansing pre-winter. I am loving having all my windows open and watching the wind twirl my curtains around. And I have 3 huge boxes set aside in my basement for a yard sale. Thanks for reminding me I need to get on that! I love it--I've never seen anything quite like it. The diamond shape on the top drawers is really effective, and I like the fat knobs. The items you chose for the top look great. 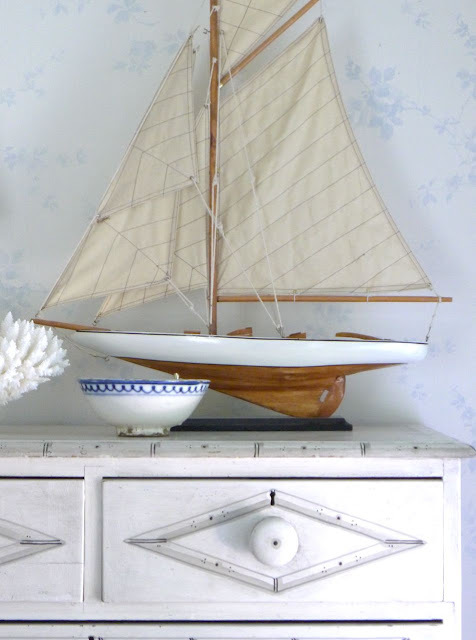 I treated myself to a driftwood sailboat from White Flower Farmhouse--it's sweet. The precision of the paintwork is stunning..in fact until you mentioned it was painted I hadn't given it a thought. I thought it was molded. Jealous, jealous, jealous! That has to be the prettiest piece of furniture I have seen all year and I have been waiting to see it styled in your home. Well worth the wait! Beautiful! Thanks for the close-up detail shots. When I saw the first photo of the chest, I didn't realize the "bamboo" was painted on ... what a nice piece. Looks great with the items you've placed on top, and the rug. Perfect, charming chest . . .Did you do the faux painting? And for hire? Can't wait to see what's going on with the bath and master. What a great find Steve and it looks like it was all hand painted. 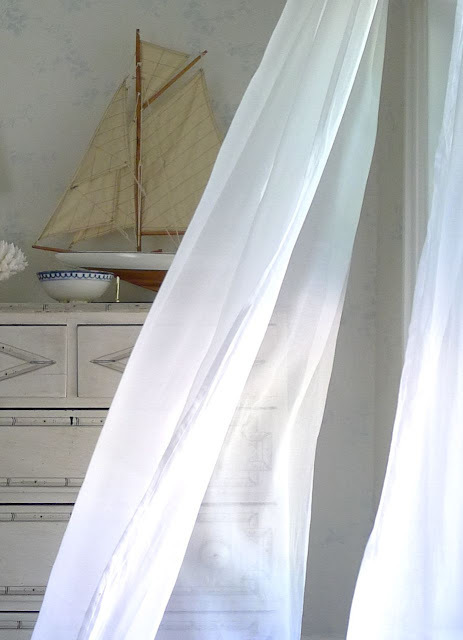 It really looks nice in your guest room and love the shot of the curtain blowing in the breeze. Another great piece, Steve! I love it. Dear Steve - I have a long list of projects to work through, but I can assure you that I will be doing a bamboo piece in the future, and that I will share. The line work is very fine, perhaps done by someone who was pinstriper by profession. 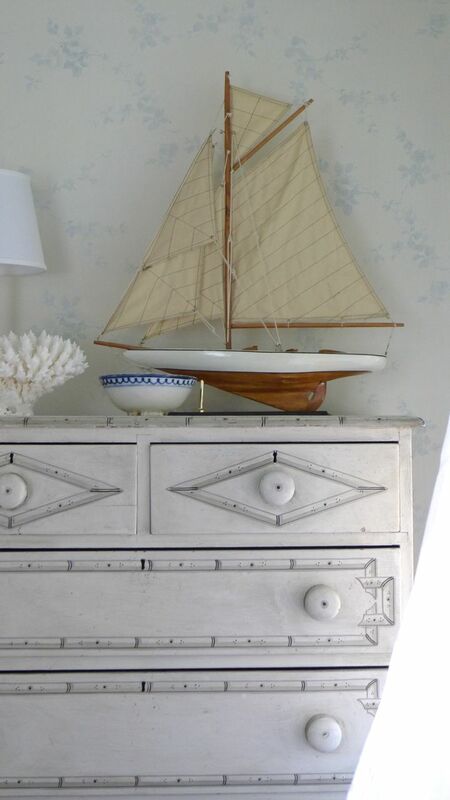 It's a lovely piece of furniture and perfect for your home...but what I really like is the first photo with the sail-like effect of the curtain that echoes the sail on the model boat. It reminds me of a painting by Eastman Johnson called "Woman Reading", which shows a woman walking along a cliff reading. She is wearing a hat that reflects the shape of a ship's sails in the distance. Thank you, J.W.! I saw the possibility of connecting those two things but it took at least 30shots to get one I was happy with. Thanks for noticing! God bless digital photography... Can you imagine taking 30 shots with film and then having to wait to see if any of them came out? (I used to...) The gesture of the curtain makes the model sailboat feel like it's heeled over on a hard tack into the wind! Fabulous chest! I can see me trying to replicate the bamboo pattern and it being a total bust, however. I'm sure there are many who could do it justice! What a spectacular piece! I can see why you would clean out and let this have pride of place. Love. You have such an eye. Wow, that's simply wonderful! I have two nightstands that I've been racking my brain trying to figure out what to do with them. I think this might be the solution. Thanks fOr posting! 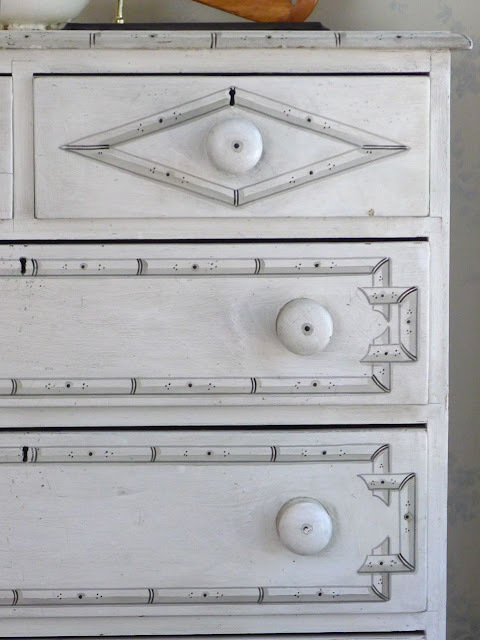 What I like about older furniture is imagining who used it originally...was it in a bedroom? A summer guest room/house? An extra piece in a dining room? It's fun to speculate. Would be fun to know about the artists, too-usually they were skilled beyond words. While the whole piece is stunning, those polished-by-usage knobs are my fave thing, because it means that someone used a beautiful thing on a daily basis-that's the way to live! Until you showed the close up shots, I didn't realize that the bamboo was not three dimensional. Wow. 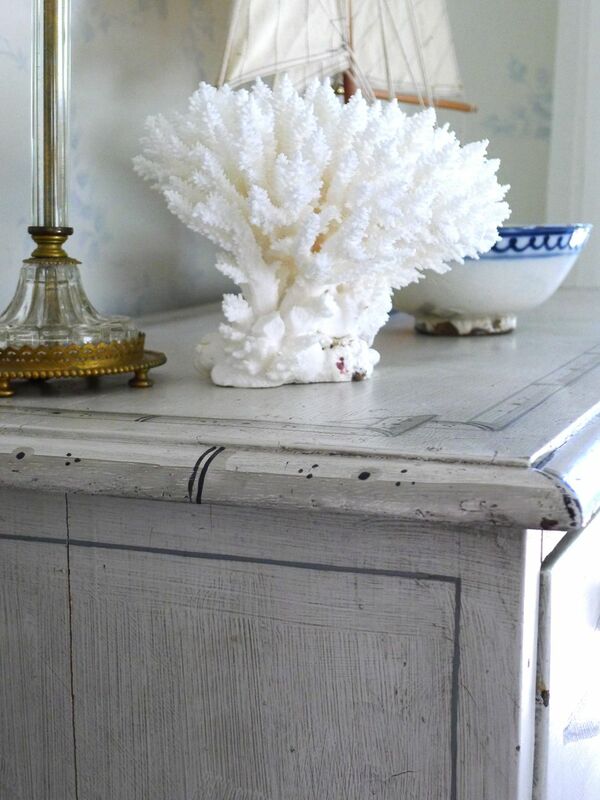 I'd love to try this on a piece of furniture! Thanks for the close-up shots. I used to paint for a small New England company that did artwork on furniture...hydrangeas, clipper ships, lighthouses and the like. The trick to fine lines is a steady hand, a fine brush and the right amount of water in your paint. (A lot of practice doesn't hurt). The success of the line lays in completing it with one careful sweep of your arm. The end will taper slightly, which adds a painterly touch, don't be tempted to rework the line,( it is never as elegant). Use a straight edge to guide your hand not the brush, and don't use tape. The paint will bleed under it and create a mess that looks amateur. If you are painting over a dry semi-gloss base with folk art or other acrylic paint for your lines you can simply wipe mistakes away with a damp cloth before it dries. 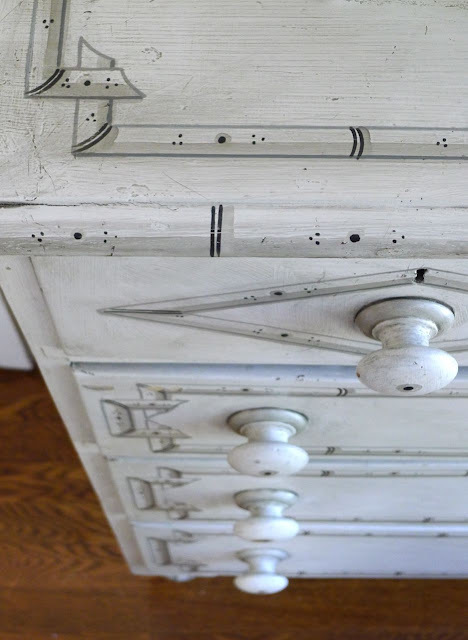 Don't rely on this trick too much or black will eventually stain. Thank you, Jennifer. I was watching a video on YouTube on how to pinstripe. It was a little daunting but based on what I saw, I think you advice is spot on. Thanks for sharing your experience! You are very welcome! I discovered your blog recently and visiting it soothes my New England "homesickness" now that I'm back in my native Canada. of faux bamboo and perfectly placed there's that eye again. Love the chest Steve... the technique makes it look so real! And, I envy you with your open window and cool September air...It is still a little warm here in Texas for that. 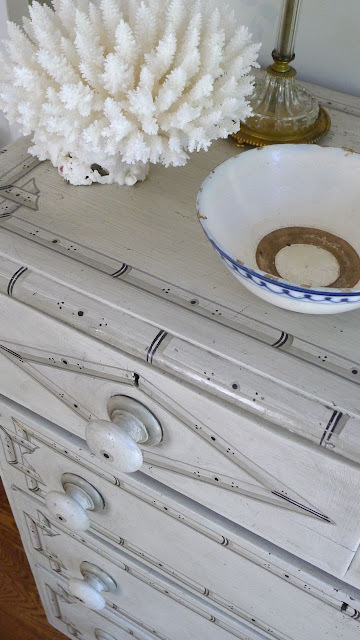 It is perfect in the guest room and I absolutely LOVE your vignette...gorgeous!! How beautiful! Sorry I missed this post. I love the photos with the curtains blowing - I can almost feel the breeze. Love the trompe l'oeil - utterly amazing! It took me a minute to understand what you meant by "faux" - I could not decide what part of 1880 was faux. Love the room. Them bad kitties! This is gorgeous...It's hard to believe it's faux bamboo! I love the look against the wall and of course the items you've chosen to place on top, but my favorite is the shot with that September breeze blowing through...I do love being back in four season weather. Oh I'll undertake something like that when hell freezes over. If I did it would look like somebody's 1st grade project. You made a good selection with your yard sale funds! How did I miss this post? Oh crap I've been away. 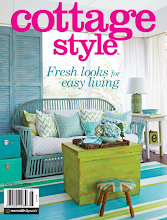 What a sweet story on this cottage, love to read things like this....and of course love you work....Sel.